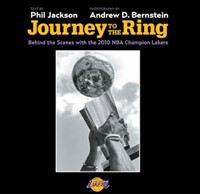 Notes | Journey to the Ring pairs Phil Jackson, the NBA's most successful coach, and Andrew D. Bernstein, the NBA's senior director of photography, in an exciting, behind-the-scenes re-creation of the Los Angeles Lakers' 2009-10 championship season. Having long built a trust with the NBA's biggest stars, Bernstein is given access to the Lakers' practices, team planes, training room, coach's office, game-day meetings, and off-the-court glimpses. Peek in on Chef Phil preparing a Jackson family Thanksgiving dinner, and more. Jackson, coach of eleven NBA championship teams, gives insight into games, practices, his players, and what he is saying in the huddle. What sets Journey to the Ring apart is the deep appreciation Jackson and Bernstein share for the depth of black-and-white photography, which is elegantly reproduced here in four-color black-and-white processing. It is a look into the eyes of a team that gave L.A. its first NBA Finals' Game 7 victory over the Boston Celtics. Andrew D. Bernstein, senior director of NBA Photos, joined the NBA in 1983 and has been its senior photographer since the position was created in 1986. In his twenty-eight years with the league, Bernstein has shot every NBA Finals since 1983, covering more championship series games than any photographer.